Booking appointments is not as easy as it looks. If you’re an independent stylist and manage a business of your own, you’re familiar with the struggle. Or if you’re a customer in need of a stylist, you know how hard it is to find and book the services you need. Well, worry no more! Today we’re presenting you a great appointment booking app called Ring My Stylist – it is our choice for a Productivity App of the Week. See why below! Ring My Stylist is an amazing cross-platform productivity app that’s designed to ease and simplify the way stylists businesses connect with their clients. It is a great way to connect with your clients and to book your appointments. 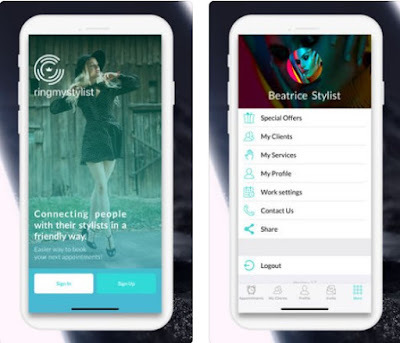 The app is perfect for independent stylists and clients that regularly use stylists’ services, it is smoothly designed and offers various useful features. With Ring My Stylist now you can easily manage your independent stylist business and have all appointments under controls. The app is created especially for various types of independent stylists: Hair Stylist, Esthetician, Makeup Artist, Skincare Specialist, Nail Artist, Hairdresser, Fashion Designer, Barber, Tattoo Artist, Masseuse, Image Consultant/Stylist, Foot Masseuse, Body Piercer, Manicurist, Eyelash Technician, Photo and Film Stylist, Bridal Make-Up Specialist, etc. All you have to do is build a profile with portfolio, pictures, information about the services you’re offering, working days and hours and let clients connect with you. You will receive notifications (emails, push notifications, SMS notifications) about new appointments, reminders 1, 3, 5, 10 days before the appointment, the clients will receive special offers, and so on. The Ring My Stylist is completely free for clients, but for stylists it offers a free month trial and a subscription option. Nevertheless, it is perfect for booking appointments and seamless client management. Click one of the direct links below and get the app right away!